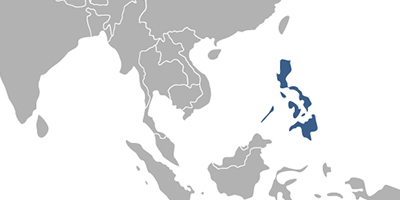 The Philippines, officially the Republic of the Philippines, is a sovereign island country in Southeast Asia situated in the western Pacific Ocean. The capital city of the Philippines is Manila and the most populous city is Quezon City. Bounded by the South China Sea on the West, the Philippine Sea on the East and the Celebes Sea on the Southwest, the Philippines shares maritime borders with Taiwan to the North, Vietnam to the West, Palau to the East and Malaysia and Indonesia to the South. Fees associated with registration of IP rights in the Philippines are available in the fee calculator.